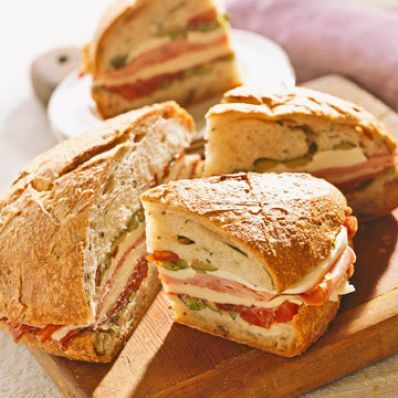 The deli meats and cheeses that go into this jumbo sandwich sometimes vary, but it's generally made in a round loaf, dressed with an olive relish, and cut into wedges to serve. 1 of 2 Mix olives, tomato, celery and garlic in bowl. Whisk oil, vinegar, seasoning, salt and pepper in another bowl. Add to olive mixture. Refrigerate at least 1 hour. 2 of 2 Spoon 1 cup olive mixture over bottom half of bread. Layer on salami, provolone, ham and mozzarella. Top with remaining olive mixture. Cover with bread top. Wrap loaf in plastic; place on baking sheet. Weight with heavy pot. Let stand at room temperature 1 hour. Cut in 8 wedges. Makes 8 sandwiches. Per Serving: 18 g pro., 39 g carb., 463 kcal cal., 1455 mg sodium, 3 g fiber, 8 g sat. fat, 26 g Fat, total, 42 mg chol.